Samsung Finally released the Android 6.0.1 Marshmallow update for Galaxy S6 & S6 edge Android smartphone. The new update is available for the OF Vodafone users. If you have a Samsung Galaxy S6 SM-G920F or S6 edge SM-G925F in the UK with Vodafone, then you can use this tutorial to update your phone with the latest firmware. The new official update come with lots of new features and improvement. 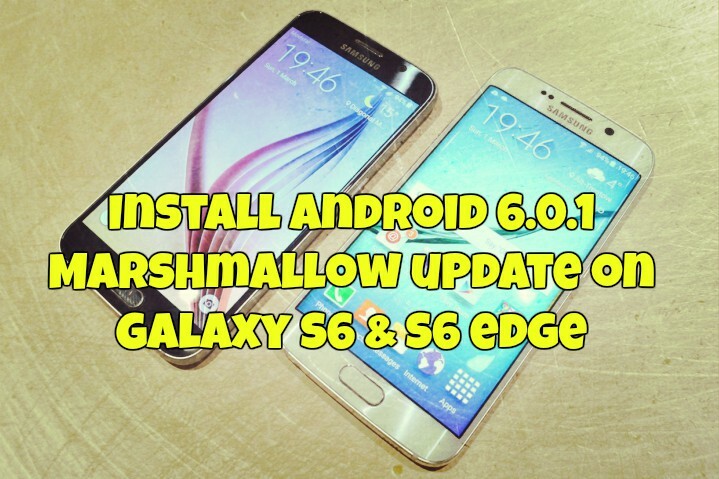 All you have to download and flash the official Android 6.0.1 Marshmallow firmware on your Galaxy S6 and S6 Edge without having to wait for the update by Samsung. The process is very simple and takes a few minutes to complete the whole task. Once the Firmware is updated on your phone, you can enjoy all the new feature of Android 6.0.1 Marshmallow update on Galaxy S6 & S6 edge. Before following this guide, do take the full backup of your phone and save it in some safe place, or you can check out our guide here how to take the full backup od Samsung Android smartphones. This guide is only for the Galaxy S6 & S6 edge Vodafone UK users and don’t try this method on any other android smartphone. Step 1. First you have to install the SAMSUNG USB driver on your PC. Without these drivers, you can’t connect your phone tot he PC. Use this link to install the same on your PC. Step 2. After installing the USB drivers on your PC, download the Android 6.0.1 Marshmallow Update zip file from the below links and extract the folder on your desktop. Step 3. To flash the firmware on your Galaxy S6 & S6 edge you need an ODIN flash tool. Download it from here and extract the folder on your desktop. Step 4. Now run the ODIN.exe file on your desktop and boot your Galaxy S6 & S6 edge in download mode. To do this turn off the phone, then hold VolDown+Home+Power to boot – if it asks you to press a button to continue. Step 5. Once you phone in Download Mode. Connect phone and wait until you get a blue sign in Odin. Step 6. Add the firmware file to AP / PDA. Make sure re-partition is NOT ticked in ODIN screen. Step 7. After that Click the start button, sit back and wait few minutes. This will take some time and once the process is finished you will see the RESET! or PASS! message on ODIN screen. It’s really good new for samsung s6 and s6 edge users. But After installing an update, always go to storage in settings, clear cache and restart!